Frustration On The Creative Endeavors – When You Can’t Get Anything Finished! Ever have one of those days? Well, I am having one of those months! I have about ten projects all going at the same time and it seems that for one reason or another, I cannot get a single one finished! Timing or materials or weather, something seems to stand in the way of completing the project. My big project and the one I am most excited about is now 99.9% complete! I am waiting on one more simple (or I hope simple) finishing touch and a nice day of weather to get the project photographed. Argh! It is so frustrating to be so close to completion that I have nightmares about it! No joke! I’ve stopped picking up project pieces since the weather is going to soon become the kind of weather that prevents me from driving my little sports car. When that happens, I usually drive it into the third garage stall, cover him and put him into hibernation. Well, in order to do that, I have to get that stall cleaned out, so I have been a busy little beaver trying to get things done. It is either that or get rid of them. And I am trying to do both. I picked up this awesome antique bench thinking it would be an easy project, but it has turned out to be anything but. Sigh. I work on it a little and then get frustrated or tired of fighting with the four million staples/nails/tacks and move to something else. I am close to finishing the four poster bed frame that I am painting in the same pink ombré style, but of course, I had to spend an inordinate amount of time to find the right connectors for the side boards, so it too has taken a place at the back of the line. I picked up this not-so-little entertainment center for the express purpose of harvesting pieces – like the doors and drawers and shelves – as I am planning on building a gun cabinet for The Kid’s personal collection of antique fire arms. They are very nice pieces, so the cabinet needs to be of the same quality. This thing weighed like two thousand pounds when we picked it up and much of it is turning out to be real wood (as opposed to the junk compressed wood in many) so I am harvesting much more than I thought I would be. And of course, it too, was well made with about a ton of glue, staples, screws and nails so it is taking much more effort to get it apart than hoped. The end table to dog crate too, is almost complete. It has turned out to be a bit heavy, so as an added bonus, I am planning on adding wheels (found on the entertainment center) to make it easier to move around. Of course, the wheels are on the bottom of the entertainment center, so they are close to last in coming off, but maybe – just maybe – that can be completed today. As a consequence of the weather and knees, I’ve been back to sewing some. I made a personal vow not to make any more quilts until I can get some of the tops completed quilted. My best guess is that there is between 200 and 300 waiting for someone to do this step and then I do the binding. I just cringe each time I think about the money that will be needed to do this. So, they wait. In the meantime, I’ve been working on using up my scraps. I just put on a good movie and sew, really without much thinking. I’ve also been working on a postage stamp baby quilt (I think I might be able to do the quilting on my sewing machine) just to use up these last few hundred pieces. A few years ago, I ordered this box of charm pieces (2000!) 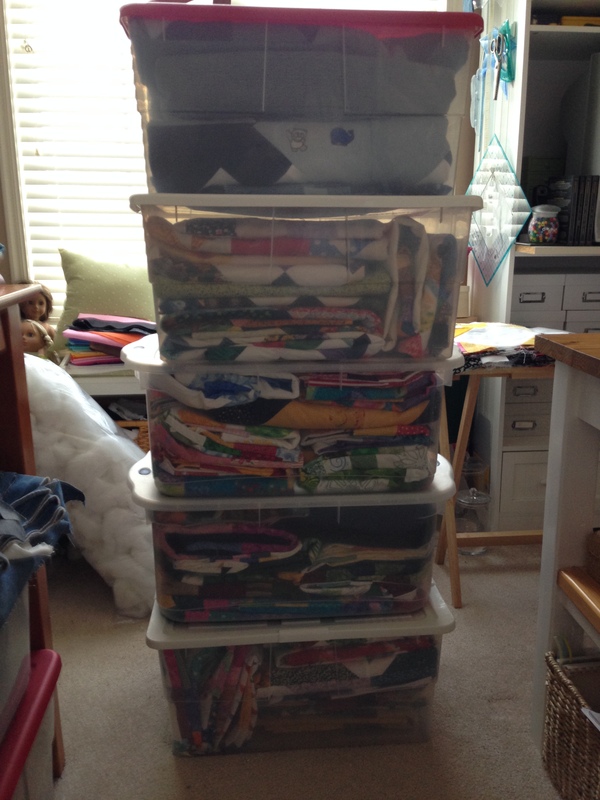 that are 1.5″ squares and used a good deal of them in several quilts. I just can’t bring myself to toss the remaining, although they are what I call “the uglies”!! Does anyone else here have this issue? I’ve also been working with felt pieces while I ice then heat my knees. I’ve made a bunch of Christmas decorations (although we don’t really celebrate or decorate in the house), as well as working on another needle book. I need to just need to finish the cover. Of course over in the corner next to the fireplace is that great big hulking needlepoint project… just sitting there mocking me. I’ve resisted writing just this post – the one where I admit that I can’t seem to get anything completed! Its just so aggravating and humbling to have to admit to all this incompleteness! I really try to hold myself to a higher standard, but sometimes it is so overwhelming – and I realized that it has been quite a while since I last posted. But to have to post and say I’ve got nothing! Argh! Best intentions aside, time to get on with the day. I really need to assess what is left and what still needs to be done and what is required to get to that point. And then just start tackling them, one by one. Wish me luck! And to all those out there who think us bloggers just get things done out of discipline and attention? We’re just people too and infallible. So don’t worry that you’re project(s) isn’t getting done. It happens to all of us!